Key questions and answers on California's Proposition 6, the "repeal the gas tax" initiative. What would Proposition 6 do? First, it would repeal the package of fuel tax increases and new vehicle fees enacted last year by SB 1. That legislation, championed by Gov. Jerry Brown and passed by a two-thirds majority in both the state Assembly and Senate, is designed to raise $52 billion over the next decade for highway and street repair, transit and other transportation projects. Second, Proposition 6 would amend the state Constitution to require voter approval of future fuel tax and vehicle fee increases, a provision expected to make it more difficult to enact similar levies in the future. Exactly how much more are those SB 1 taxes and fees? SB 1 imposed a new “transportation improvement fee” on car and light-truck owners based on the value of their vehicles. The fee ranges from $25 a year, for vehicles valued at $4,999 or less, to $175 a year for vehicles valued at $60,000 and up. The state began collecting the fee on Jan. 1. The law also includes a $100 “road improvement fee” for zero-emission vehicles. The fee will be charged beginning in July 2020 and cover vehicles from model year 2020 and later. Who is behind Proposition 6? In a word: Republicans, including GOP lawmakers and party activists at the federal, state and local level. The official proponent of Proposition 6 is Thomas Hiltachk, a veteran Republican attorney in Sacramento who played leading roles in the 2003 campaign to recall Gov. Gray Davis and many past ballot measures, including one that sought to suspend AB 32, the state's landmark greenhouse gas law. The public face of the repeal campaign is Carl DeMaio, a Republican former San Diego city councilman who was edged out in his 2012 campaign to become mayor and again in 2014, when he ran for Congress. He calls the repeal campaign "the biggest taxpayer revolt in California since 1978’s Prop. 13." The repeal campaign has become a centerpiece of Republican gubernatorial candidate John Cox's campaign. It has also drawn support from retiring House Speaker Paul Ryan, R-Wisconsin, and his second-in-command, Central Valley Rep. Kevin McCarthy, who see it as a vehicle for boosting GOP voter turnout. Most GOP legislators, at both the state and federal level, and tax limitation groups like the Howard Jarvis Taxpayers Association, also support the repeal. What are the arguments for Proposition 6? Proposition 6 backers cite several reasons they oppose SB 1's higher fuel taxes and vehicle fees. They say the increases hurt California families struggling with the state's high cost of living, that our fuel taxes and vehicle fees are too high already and are spent inefficiently, and that the state already brings in enough money to pay for road and street maintenance without the higher taxes. A broad coalition. In addition to Gov. Jerry Brown and most Democratic legislators, they include: scores of city and county governments, including 30 in the Bay Area; major business groups, including the Bay Area Council, Silicon Valley Leadership Group and California Chamber of Commerce; police and firefighters unions; construction firms and trade unions; environmental groups; many transit agencies, including BART; and engineering, planning and transportation organizations. What are the arguments against Proposition 6? Proposition 6 opponents say the tax and fee revenue from SB 1 -- about $5.4 billion a year, to be collected for the next decade -- is essential to repair and maintain highways, local streets and bridges, and to support a wide variety of transportation network improvements to address traffic congestion, pedestrian safety and improving public transportation. They say that California drivers are paying substantially more for driving on poorly maintained roads -- for added repairs and maintenance, lower gas mileage, time in traffic traffic and the cost of crashes -- than they do for the increased fuel taxes and vehicle fees. They add that SB 1 is just part of what's needed to help the state deal with an estimated $137 billion backlog of transportation infrastructure maintenance and repair projects in the coming decade. How much SB 1 funding is distributed to local governments? How much will come to the Bay Area? Half of the $5 billion-plus raised each year by the increased taxes and fees goes to city and county governments for local projects. The Metropolitan Transportation Commission says the nine-county Bay Area will get at least $365 million a year from SB 1 revenues. 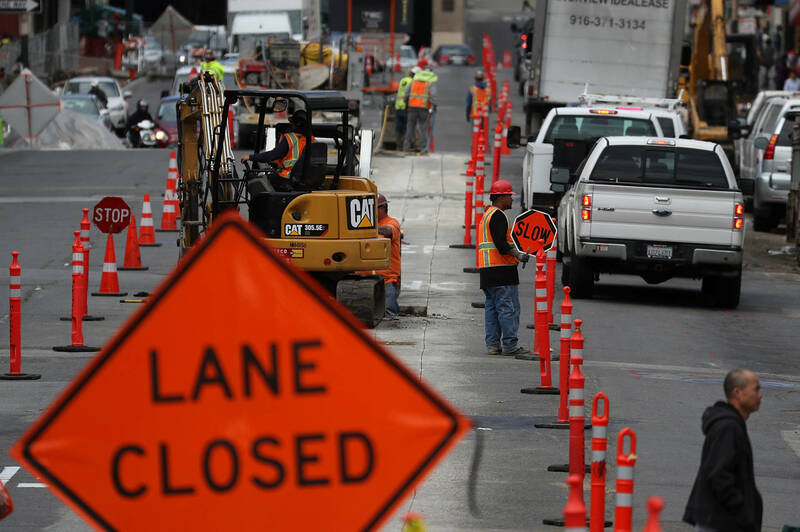 One example of the local impact: The San Francisco County Transportation Authority estimates that the city will get about $60 million in increased funding for street resurfacing, for Muni operations and other projects. Caltrans has published a statewide map and list of projects to be paid for by SB 1. One of the main arguments for the SB 1 fuel tax and vehicle fee increases is the poor condition of California roads and streets. How bad are they? The American Society of Civil Engineers gives California roads a grade of D.
TRIP, a national group sponsored by insurance companies, highway engineering and construction firms, unions and groups campaigning for safer and more efficient surface transportation, reports that the San Francisco-Oakland (71 percent), San Jose-South Bay (64 percent) and Los Angeles-Long Beach-Anaheim metro areas have the nation's highest percentage of streets and highways in poor condition. Sacramento, Fresno and Southern California's Inland Empire are also in the bottom 20. The Metropolitan Transportation Commission, which requires Bay Area cities to assess and report pavement conditions, says streets and roads here have an overall score of 67 on a 100-point scale -- a regional grade of "fair." The MTC says Dublin, Clayton, El Cerrito, Brentwood, Colma, Palo Alto, Foster City, Daly City, Union City, San Ramon and unincorporated Solano County have the best roads in the region with scores between 80 and 85 points -- the "very good" range. The worst roads were in the North Bay, with Larkspur, Petaluma and unincorporated Sonoma County getting scores in the 40s, indicating overall poor pavement conditions. How much money is each side spending on the campaign, and what are the sources of campaign funding? As of Thursday, Nov. 1, the California Secretary of State reported supporters of the gas tax repeal have raised a total of $5,138,483.95. Opponents have raised $47,847,816.54. The Yes on 6 campaign has been driven mostly by small contributions -- more than 25,000 of them -- to Carl DeMaio's Reform California campaign organization. But there have been a series of large donations, too: $460,000 from the state Republican Party, $300,000 from House Majority Leader Kevin McCarthy's campaign, $250,000 from the campaign of GOP candidate for governor John Cox, and $135,000 from Republican Congresswoman Mimi Walters' campaign. The anti-repeal side's fundraising has been driven by a dozen contributions of $1 million and up from construction unions and contractors' groups. Beyond that, the donor list looks like a "who's who" of the state's construction industry. The largest individual contribution listed, $250,000, comes from Steve Ballmer, former CEO of Microsoft, who lives in suburban Seattle.